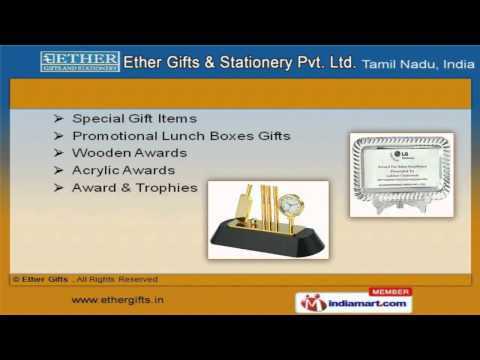 Welcome to Ether Gifts. Manufacturer & Exporter of Corporate Gift Items. The company was established in the year 2009, at Chennai. We are in Association with the leading vendors and we cater to South East Asia & other countries. HBO, Microsoft, Havells & Facebook are some of our elite clients and we are backed by Paid samples & outstanding packaging. We offer a huge gamut of Key Chains, Metal Ball Pens & Executive Gift Sets. Acrylic Awards, Special Gift Items & Promotional Lunch Boxes offered by us that are widely appreciated in the market. Our Baseball Caps, Sports Items, Leather Wallets & Covers are extremely reliable. We offer Pocket Watch, Desktop Items & Promotional Table Watches that are superior in performance. We also provide Miniature, Stationary Items & Visiting Card Boxes that are available at affordable prices. Along with that we offer Pen Drives, Photo Frames & Wood Awards that are in huge demand across the global markets.